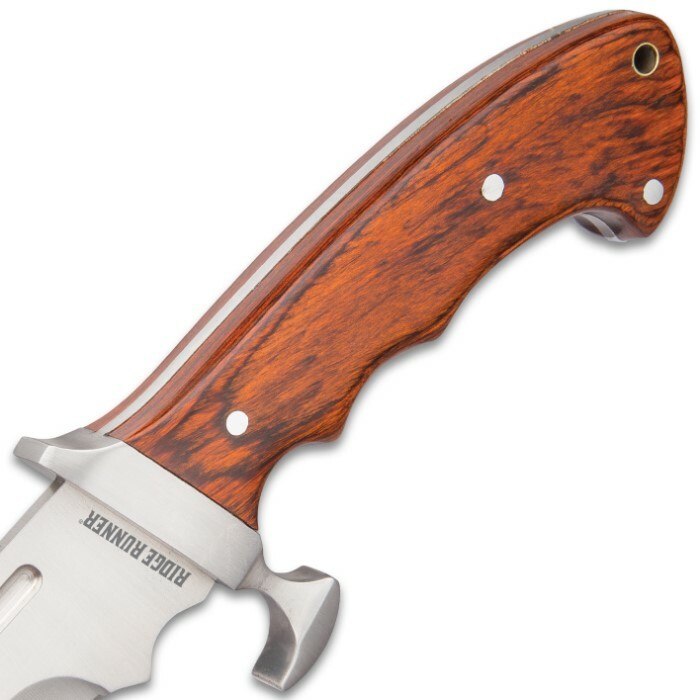 Ridge Runner Woodland Reverie Bowie / Fixed Blade Knife - Stainless Steel, Full Tang - Genuine Zebrawood - Nylon Sheath - Collecting, Field Use, Display and More - 14 1/2" | BUDK.com - Knives & Swords At The Lowest Prices! 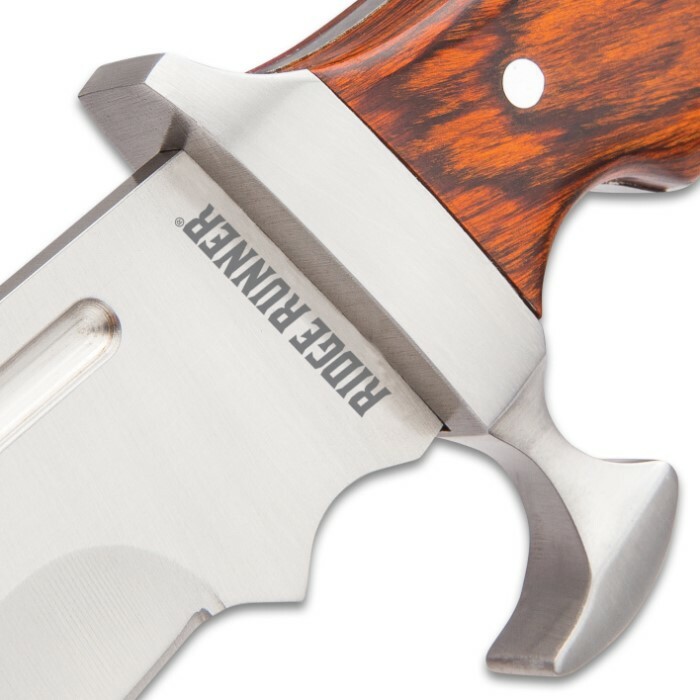 Ridge Runner’s "Woodland Reverie" Bowie Knife is grand and robust, yet teeming with subtleties and nuance - from the dramatic striped grain of the zebrawood handle to the distinctive cast metal guard. It's easy to get lost in its impressive size and build; indeed, the "Reverie" is a hulking beast with a powerful blade. Pick it up, and the Reverie's big, bad nature becomes even clearer, as it boasts a rock-solid, weighty - but not cumbersome or unwieldy - feel. And it's not just look and feel. The Reverie's full tang construction ensures that behind that size and weight is genuine, raw muscle - no "fat" or superfluous filler. 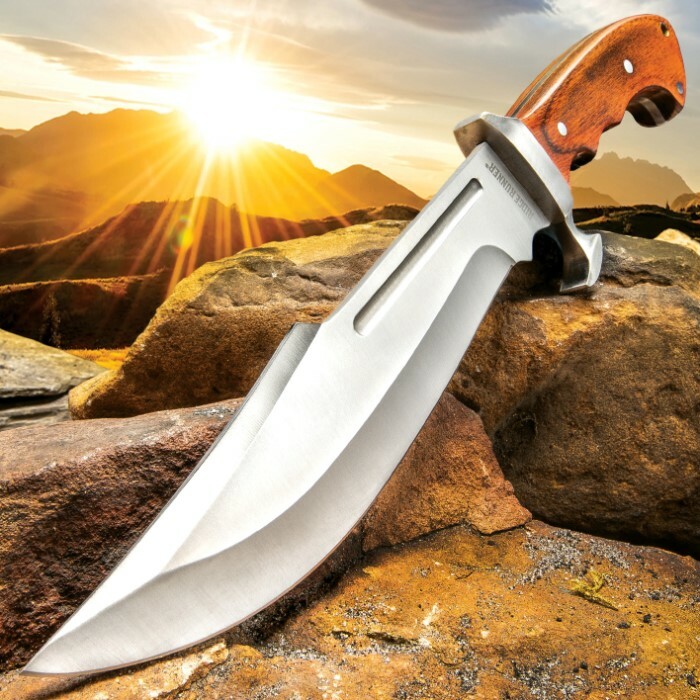 In other words, the Reverie looks big and bad, feels big and bad and IS big and bad - a capable bowie in the field, around the house, on the ranch, or in its namesake "woodland." 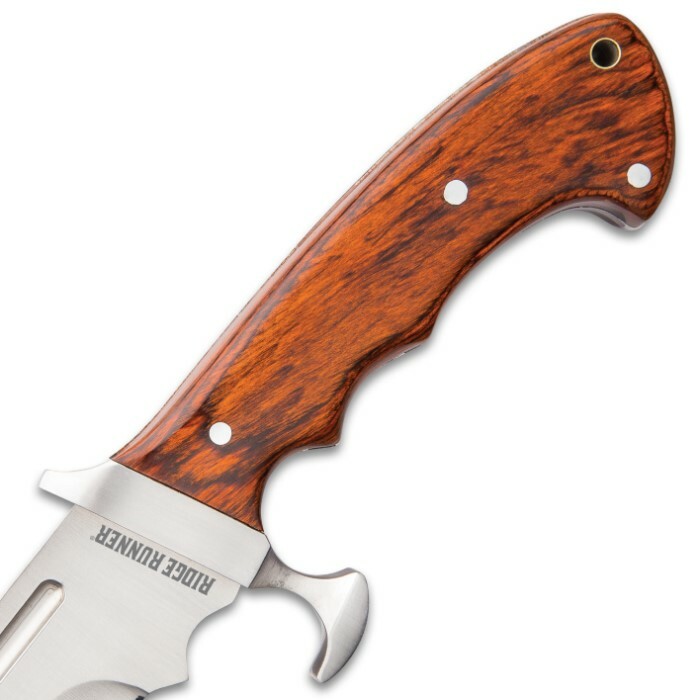 Despite its size, the “Woodland Reverie” is a pleasure to wield, thanks to impeccable balance and weight distribution and a handle that feels like it was custom tailored to your own hand. But, once again, don't get completely lost in the Reverie's size, lest you miss all the enticing subtle surprises peppered throughout. Zebrawood dazzles with its eclectic array of contrasting bands. The cast metal guard boasts a sleek, eye-catching futuristic look. Even the blade profile is one-of-a-kind. Simply put, the Reverie slashes to the beat of its own drum and is chock full of fine details you won't find in other bowies - especially not at this price. 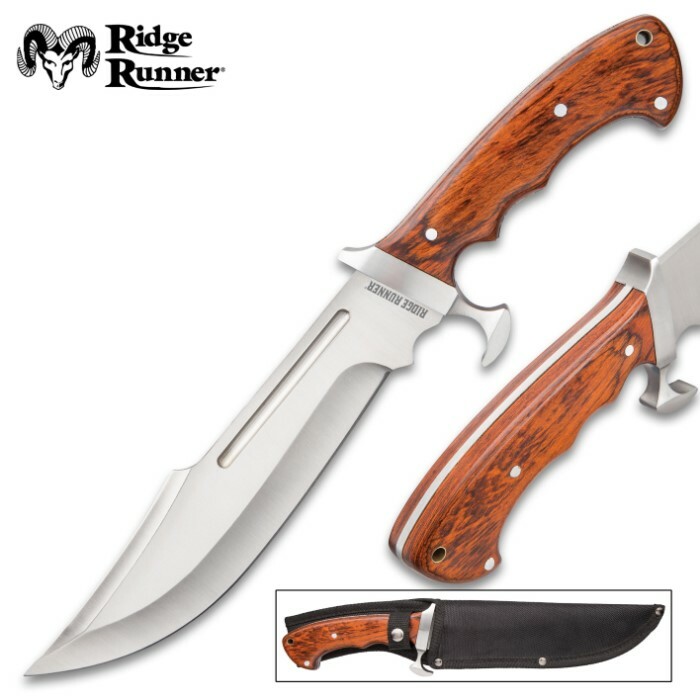 Ridge Runner's Woodland Reverie will chop, slice, hack and cleave its way through any task, and it'll look good doing it. It's the vibrant, attention-demanding piece every collection needs. 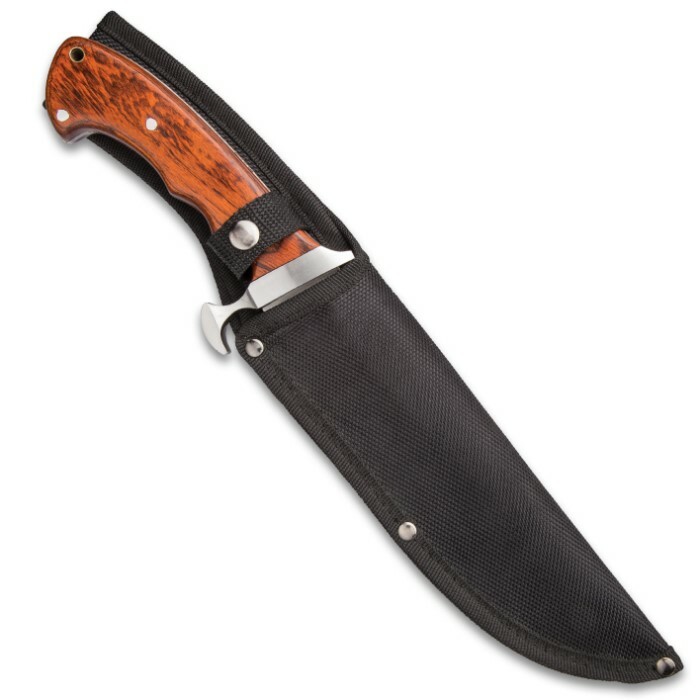 I'm a Timber Rattler fan...but this bowie looks smooth...the right length...beautiful wood...great shaped and designed well blade. Love the" finger guard" ...as long as it stays put. All around thick and slick. Congrats Ridge Runner. 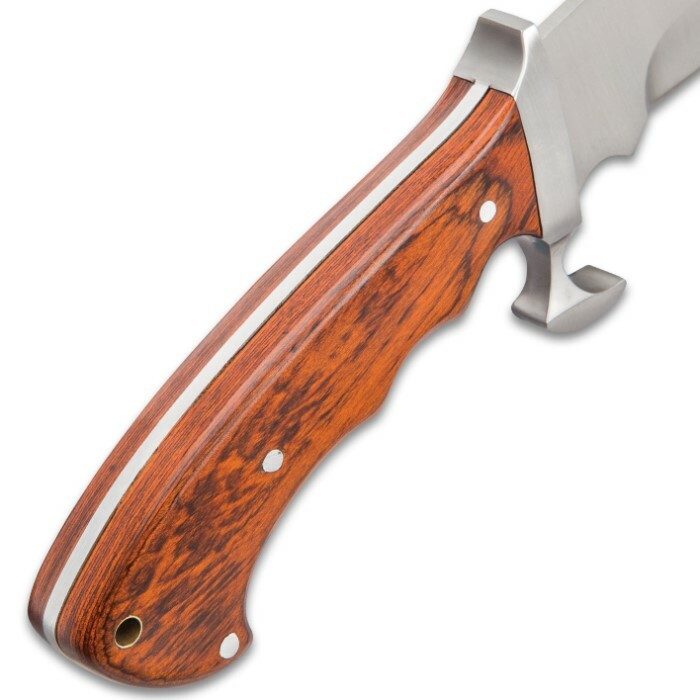 Eye appealing blade!